If you think there's something fishy about the salmon you're eating, that could be because it's not salmon. 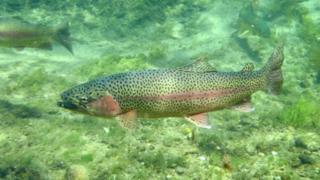 Rainbow trout are freshwater fish whereas salmon are born in freshwater but then live much of their lives in saltwater. They're so similar that in May, state media outlet CCTV revealed that a third of fish that had been sold as salmon in China was in fact rainbow trout from Qinghai province. That's a scientific category which includes trout as well as other similar fish. The ruling has got people complaining that they've been misled, but there's also a degree of sympathy for the reassigned rainbow trout. "Let's label the crayfish a lobster instead," another said. However, according to the China Fisheries Association, domestic rainbow trout are bred in safe and quarantined conditions so there's no need to worry.